Critical automation functions are realized in PLCs (Programmable Logic Controllers). These devices are robust and can work continuously under tough conditions. 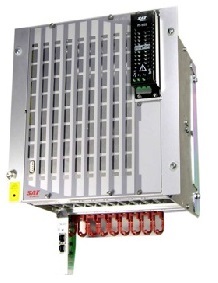 PLCs can perform the predefined critical functions perfectly without any mistakes. They can manage securely non-stop time critical activities with their robust industrial control hardware infrastructure. RTUs (Remote Terminal Unit), which have strong communication and data transmission opportunities as well as control functions, are also used for similar purposes. These devices have limited automation functions on the other hand various communication opportunities. They can communicate with Tele Control Centers (TCC) by using remote communication protocols (IEC 60870-5-101 / IEC 60870-5-104, IEC 61850). Control systems achieve error free and time critical control operations with the well designed programmed and tested PLC/RTU software. They can transmit the data which contains all the required information related operation as evaluation and result to the higher systems with the help of their supreme speed and communication capabilities. RTU/PLC hardware is long-lived, does not require maintenance, occupies less space, can work under tough circumstances without any mistake, has great performance and can be extended easily thanks to its flexibility properties. Revision can be done easily and quickly with the configuration and parameterization software. It provides so many opportunities like backup, copy, simulation and testing in office environment. Opened/closed position information’s of switching devices, thermal fault signals, auto/manual signals, warning/fault signals which are coming from the field are read by binary inputs. The signals which are coming from current/voltage/power/power factor transformers are read by analog inputs. In modern technology, all the information’s related to the feeder can be taken from the protection device, the bay control device and the energy analyzer, which are placed in feeder control cubicle, by wide communication opportunities like IEC 60870-5-103, Modbus and IEC 61850. Integration of the feeder to the system can be completed by laying out only communication cable between the feeders which provides effective, economical and secure communication opportunities. Nowadays, PLCs’ configuration and parameterization programs are improved parallel to developments in software world. With the help of user friendly interfaces and quite wide function libraries, their power is improved day by day. With the help of opportunities which are provided by international standards, they can be integrated by each other easily and effectively.